The penultimate game of the season saw Fire take on semi-finalists Lions. Encouraged by last week’s impressive 2 -2 draw with leaders Gold Coast, Fire knew that a win would keep them in the hunt for a semi-final berth of their own. Fire got the game underway in perfect spring conditions and began with a tangible sense of urgency and intensity to their game. A high tempo introduction immediately put their visitors under pressure Dre Ngaha forcing a defensive error and creating himself a half chance with a blocked shot after only four minutes. Fire earned the game’s first corner on six minutes and the deep set piece was collected by Ngaha at the back post, the ball finding its way to Herbie Allsopp who sent a low drive toward goal that was saved by the Lions keeper. Fire’s early pressure soon reaped dividends, a long 8th minute ball from Luke Vancam found Mark Shaw who escaped the close attention of the Lions defence to coolly lob the advancing keeper from 18 yards and give Fire deserved lead. Lion continued to look pressured and ever likely to make errors with Fire constantly snapping into tackles and closing space, after the restart a combination of Ngaha and Dawson almost gave Dawson a chance to immediately extend the lead. After conceding a free kick to Fire 25 yard out on the angle of the penalty area, Ngaha tried his luck. The merest of touches guaranteed to have diverted the ball into the net, the kick evade the far post by inches. The 12th minute saw Dawson racing through onto a well-placed pass and after beating the advancing keeper he found the angle was too acute and the Lions defence were able to recover and snuff out the chance. The impressive intensity of the hosts showed no sign of abating and again they won a free kick in an almost identical position to Ngaha’s earlier effort after 17 minutes. This time it was Lachie Noyes who tried his luck. Struck with precision, his excellent strike left the keeper no chance as Fire doubles their advantage. Lions had to force their way back into the game but found little joy against a Fire team resolute without the ball and dynamic on it. With some outstanding first half performances across the board. James Ridley sent a well-placed ball through to Dawson in the 32nd minute but his cross/shot was over the bar, Tanner Mathers energetically winning the ball in midfield slid a pass into Ngaha who was unable to find room for a shot. Fire keeper Bradford Green was required to make his first save of the game in the 33 minute, saving a stinging drive that was fortunately straight at him before Lions then blazed wildly over on the stroke of half time. After arguably their best 35 minutes of the season, Fire deservedly took a 2 -0 lead into the break. Early signs were promising with Ngaha relentless in his harassment of the Lions back line, forcing an error and almost reaping the rewards but his effort found only the side netting, Shaw sending a 40th minute drive wide of the diving goalkeeper and post. Ryan Tappouras improvising an effort over the bar after good work from Charlie Jeff, a minute later as Fire showed no sign of letting up on their earlier intensity. Jeff, impressing with his tenacity and work rate then created an opening for Dawson in the 43rd minute which was too high. Fire’s back line called into action for the first time in the 45th minute, Green palming away a cross and a united Fire refusing to allow Lions a shooting opportunity. A delightful cross field ball from Ngaha sent Dawson on his way in the 46th minute but the keeper was alert and happy to concede a corner. A flurry of substitutions from both sides knocked Fire out of their stride and Lions clawed their way back into the game with a shot from 18 yards the Green to do little to stop. Despite losing some rhythm and cohesion in parts, Fire were not letting up their energetic approach to the game and forced an attacking corner in the 55th minute. A deep cross was missed by almost everyone, Beppe Rocco appearing at the far post to slam home the ball and restore Fire’s two goal advantage. Fire continued to retain the upper hand, an effort from Allsopp, just past the hour mark, hitting the bar as a physical Lions side conceded another free kick in a dangerous area. With the game inching towards its climax, Fire were thankful to Vancam for some great defensive work, heading off the line as Lions pushed for a late rally, more frantic defence followed as Fire were resolute in holding onto their lead. After Fire cleared another Lions corner the referee signalled full time and Fire celebrated an outstanding victory that puts them up to fourth and in sight of a semi-final heading into next weekend’s clash with Brisbane City. Round 25 and the second meeting with Lions FC for this season where the last meeting was five months ago. As the newest NPL club to the competition Lions have cemented themselves as a force to be reckoned with and today was no different. An entertaining first half with both teams placing attacking pressure, placing shots on goal and with the game running from end to end. Lions FC scored the first and only goal of the half on the 26th minute when a successful counter attack resulted in a goal. 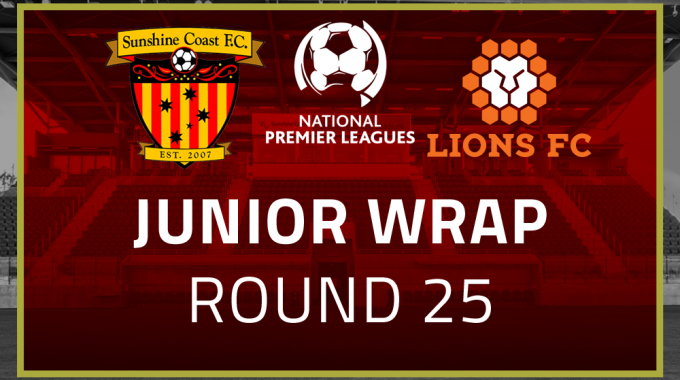 Sunshine Coast FC continued to battle it out as they were looking to close the gap. Their opportunity came when a foul in the box gave Sunshine Coast FC a penalty. Matthew Becker confidently struck the ball with the Lions keeper getting his hands to it for a deflection which was quickly followed in by Becker. Sunshine Coast FC didn’t give up until the final whistle but were unable to secure a draw or win. This game was the 100th game played by player Jayden Emery for Fire who was presented with a special edition jersey pre-game. Both teams came out strong and it didn’t take long before Lions scored in the 9th minute. 1:0 Lions in 15th minute was awarded a free kick that gave them another opportunity to score but was saved by our goalie Gillett. Fire had opportunities but they were shut down every time. Until the 33rd minute when Cullen took a corner kick. Fire attempted a goal but it was deflected out. Emery cleaned it up…smashing it into the back of the net. The score was now even 1:1. But 4 minutes later Lions would take the lead again and scored on the 37th minute. The Lions defence was hard to break as they worked hard to maintain their lead. And Fire worked tirelessly winning the ball and putting lots of pressure on their defence. The audience watched the ball go back and forth with no reward. The second half remained scoreless.